This beautiful piece of art is created by Natalya Krawczuk. Natalya is Ukrainian, living in USA. She does both – traditional and contemporary – Easter Eggs. This one, with a Big Apple City on it, is my favorite from Natalya’s collection. Another Ukrainian artist, living in USA – Daria Iwasko – is a very special friend of mine. 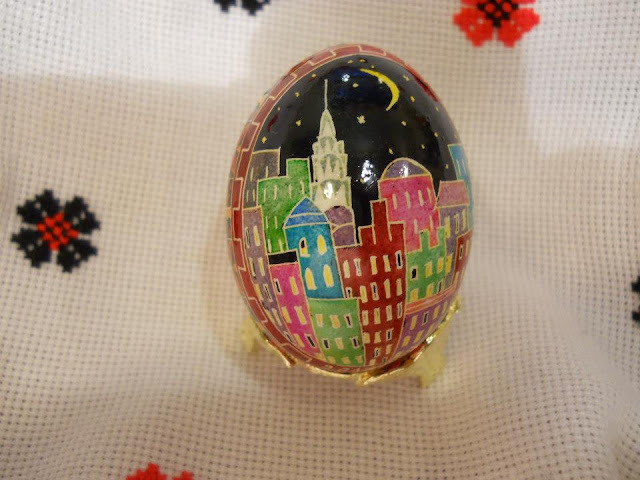 I showed you few times here, on Travel West Ukraine, a marvelous beaded eggs art, created by Daria – last year, for the Euro 2012 Soccer Championship, and Daria’s beaded decorations for Christmas. Thank you, thank you, dear Daria! It was sooo nice of you! I keep enjoying your creations; right now, in Easter time, they are warming my heart so much! Happy Easter and happy travels, everyone!